Anniversary churches are invited to construct banners celebrating their anniversaries. These are carried in for the recognition service at annual conference and are displayed throughout the conference session. The banner may be of the material and design of the church's choosing. In order for them to be of uniform size and format, however, they should adhere to the following specifications, including those for the pole on which it hangs. The commission provides only the stands, not the poles. The name of the city in which the church is located should be included on the banner. Poles may be painted. The pole to which the banner is attached is to be made of PVC pipe 1" in diameter. 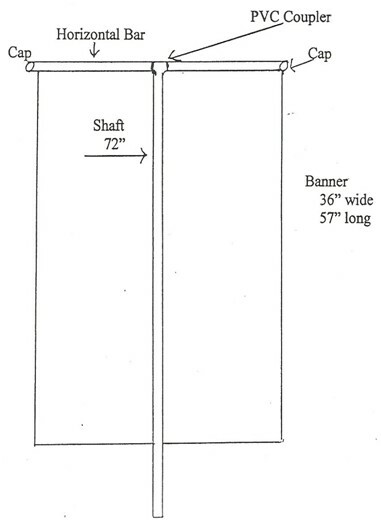 The shaft of the pole is to be 72" in length. The horizontal bar across the top of the shaft is to be 41" wide with PVC caps at each end and a PVC coupler to attach it to the shaft. The completed banner, with an opening left in the pocket in the top, is to be attached to the cross bar on top of the T.